2019 Event & Entertainment Line-Up! Weekend Adventure Pass – Three Parks – One pass for $39.99 enjoy unlimited visits on Friday, Saturday & Sunday to the Pleasure Pier, Kemah Boardwalk and Downtown Aquarium Houston. 5 – 7 Landry’s Select Club Weekend - LSC members receive Buy One Get One All Day Ride Pass at regular price ($26.99), get the 2nd FREE! Must show valid LSC card. 11 Homeschool Day - Homeschooled students are invited to join us for a day of educational thrills! 12 – 14 Crawfish Crazy Weekend - Live Zydeco music and Crawfish all weekend! 21 Easter Celebration - Join us for Easter Bunny photos and a Golden Egg Hunt! Weekend Adventure Pass – Three Parks – One pass for $39.99 / $49.99 enjoy unlimited visits on Friday, Saturday & Sunday to the Pleasure Pier, Kemah Boardwalk and Downtown Aquarium Houston. 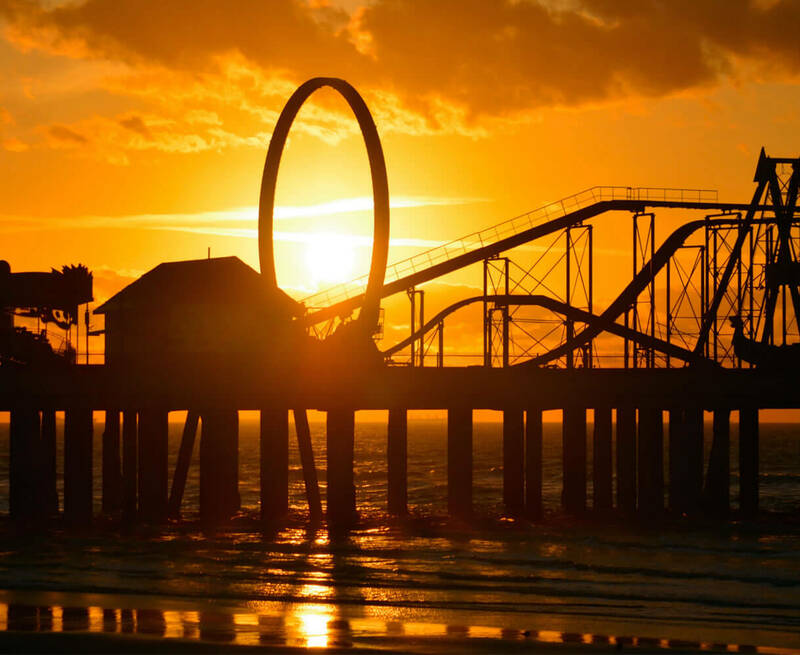 24 – 27 Memorial Day Weekend – Three Parks – One Pass for $49.99 enjoy unlimited visits on Friday, Saturday, Sunday & Monday to the Pleasure Pier, Kemah Boardwalk and Downtown Aquarium Houston. Weekend Adventure Pass – Three Parks – One pass for $49.99 enjoy unlimited visits on Friday, Saturday & Sunday to the Pleasure Pier, Kemah Boardwalk and Downtown Aquarium Houston. Thrill Ride Wednesdays – Experience the thrills in June when you can buy one get one ½ off all day ride pass. 8 & 9 Craft Beer & BBQ – Live music, beer and BBQ all weekend! 14 – 16 Salute to Military & First Responders- Buy One Get One Free All Day Ride Passes for active military, veterans, first responders and their families. Must present valid ID for discount. Sunday Movie Night – Enjoy a movie under the stars! Texas Country Music Series - Two step on the Pier with Texas country band every Thursday night! Weekend Adventure Pass– Three Parks – One pass for $49.99 enjoy unlimited visits on Friday, Saturday & Sunday to the Pleasure Pier, Kemah Boardwalk and Downtown Aquarium Houston. 16 National Roller Coaster Day – Buy one All-Day Ride Pass get one for $5! 23 – 25 Landry’s Select Club Weekend - LSC members receive Buy One Get One All Day Ride Pass at regular price ($26.99), get the 2nd FREE! Must show valid LSC card. Weekend Adventure Pass Pass – Three Parks – One pass for $39.99 enjoy unlimited visits on Friday, Saturday & Sunday to the Pleasure Pier, Kemah Boardwalk and Downtown Aquarium Houston. Weekend Adventure Pass– Three Parks – One pass for $39.99 enjoy unlimited visits on Friday, Saturday & Sunday to the Pleasure Pier, Kemah Boardwalk and Downtown Aquarium Houston. Halloween Movie Nights – Saturday nights in October join us for spooky fun and Halloween movies. 10 Homeschool Day - Homeschooled students are invited to join us for a day of educational thrills! 11-14 Columbus Day Weekend - Our Weekend Adventure Pass will be good Friday – Monday this weekend! 26 Halloween Party - Bring the kids out for a ghostly good time with discounted ride tickets, trick or treating, movies and more! 8– 10 Salute to Military & First Responders – Buy One Get One Free All Day Ride Passes for active military, veterans, first responders and their families. Must present valid ID for discount. 28 Thanksgiving Day - Celebrate Thanksgiving with friends and family on the Pier! November 29 – 12/1 Landry’s Select Club Weekend Weekend – LSC members receive Buy One Get One All Day Ride Pass at regular price ($26.99), get the 2nd FREE! Must show valid LSC card. 25 Christmas Day – Enjoy the fun with family and friends. 31 New Year’s Eve – Ring in the New Year with us! Schedule subject to change without notice. Concerts may be canceled due to inclement weather. Please check us out on Facebook for the latest updates.